A great turnout for both races as the eight race Summer Series started. First race so all boats in on handicap fleet and winner was Kevin Last from Nick Turnbull-Ross and Kevin Milton. 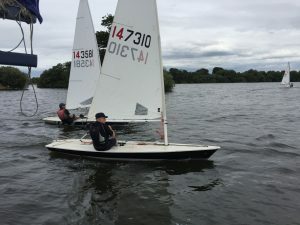 Kevin also won the fast fleet from the fast improving Nick Whiles and Kevin Milton. Mike Pritchard won the Slow Fleet from Nick Turnbull-Ross and Iona Reid doing well in a Topper. Best wishes for our Supernova sailors at the Supernova National Championships in Pwllheli next weekend.